From the chart above, we know how the altimeter works. Normally the air pressure is constantly changing, so the collected height will have some deviations by this changes, variance tolerances are between + –50 meters. And in actual mountaineering this deviation is negligible. 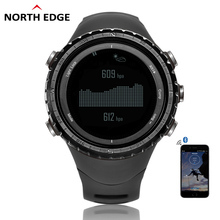 For example mountain climbing altitude for 2000 meters, 50 meters deviation is very little for the whole process, no influence on the actual climbing. 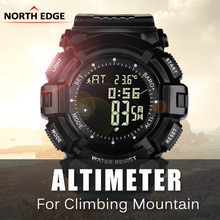 Currently the altimeter for all climbing watch works in this way, so the little deviation in height collection caused by air pressure changing is unavoidable. 3, what is altitude? And what is relative altitude? Altitude means the vertical height from sea level to the location you stay. 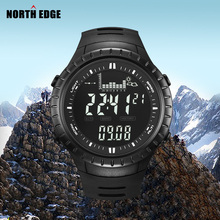 Relative Altitude means the height from the foot to the summit of the mountain, when we go hiking, at the mountain foot we clear the relative height to zero and after we reach the top, the relative altitude on the display is the height of our actual mountaineering. Here comes a picture for your easy reference. (1)For the first time to use the watch, we need to adjust the weather forecast value according to local value, it can be searched on internet. (2)The weather forecast is foreseeing the weather in 24 hours, not for the nowadays. 5, why the back light is dim? Under daylight, you may feel the back light is dim, however in the night, in dark room without any light, you will see the back light is bright enough. It is designed for energy saving. Please open below youtube link to see the watch back light effect in dark. 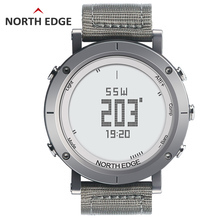 https://youtu.be/_qg1wuu3YOM https://youtu.be/HUOpdWmGJxQ https://youtu.be/ZuDZVHahLg8 https://youtu.be/-_Pl57nqSUw 6, Tips for water proof All North Edge watches are 5ATM water proof, it is suitable for swimming and diving. The buttons are not allowed to be pressed when whole watch in the water. The watch cannot be used in hot spring, hot water shower, sauna to prevent from hot water steam.